Hydroacylation refers to the addition of a hydrogen atom and an acyl group across an unsaturated moiety. Catalysts derived from ruthenium, rhodium, cobalt, and nickel enable reactions of aldehydes with alkenes, alkynes, and carbonyl compounds. Enantioselective variants employing chiral ligands have been developed. In 1965, Tsuji reported the decarbonylation of aldehydes by Wilkinson’s catalyst. 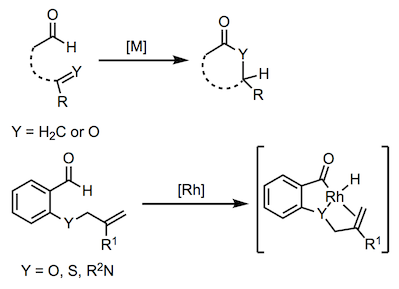 An acylmetal hydride intermediate was proposed in the mechanism of this reaction, suggesting that rhodium(I) catalysts might be effective in hydroacylation of unsaturated functional groups. Since that time, numerous examples of hydroacylations of alkenes, alkynes, and carbonyl compounds catalyzed by rhodium(I), ruthenium(II), and other metal complexes have been reported. In this reaction, hydrogen and an acyl group add across a carbon–carbon or carbon–oxygen pi bond, yielding a ketone or ester (Eq. 1). Transition metal complexes are commonly used as catalysts for hydroacylation. The most common metal centers are rhodium(I), ruthenium(I), cobalt(I), and nickel(0). The development of highly active cationic rhodium(I) catalysts was an important advance that helped address problems with decarbonylation (see Mechanism and Stereochemistry). Hydroacylation is most commonly applied in an intramolecular fashion to substrates containing both an aldehyde and an alkene, alkyne, or carbonyl group. However, many intermolecular reactions have been developed and these typically rely on Lewis-basic directing groups within one or both substrates. A second important general strategy for intermolecular reactions employs 2-amino-3-picoline as a co-catalyst, which reacts with the aldehyde to form an aldimine that coordinates the metal catalyst. In the majority of metal-catalyzed hydroacylation reactions, decarbonylation is the most important side reaction and preventing it is a key principle of method development in this area. Enantioselective variants of the reaction may involve kinetic resolution of a racemic mixture or desymmetrization of an achiral starting material. 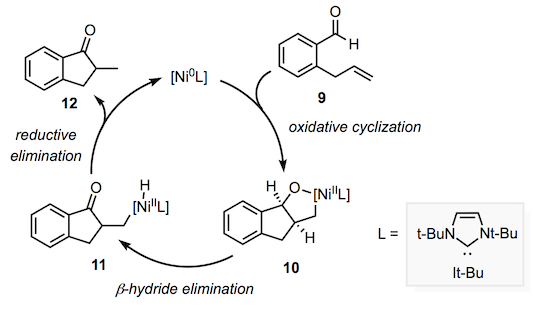 The putative mechanism for hydroacylation by rhodium(I) catalysts involves oxidative addition, migratory insertion, and reductive elimination. Oxidative addition of the transition metal catalyst to the aldehyde C–H bond first generates acylmetal hydride 1. Migratory insertion of the alkene into the metal–hydrogen bond generates complex 2, which undergoes reductive elimination to afford the organic product and regenerate the starting metal complex. Reductive elimination is often the turnover-limiting step in this catalytic cycle. Species 1 can also engage in a deinsertion process that results in decarbonylation. Reductive elimination then yields alkene 3 and a catalytically inactive metal carbonyl complex (Eq. 2). Regioselectivity is relevant to many hydroacylation reactions. In intramolecular reactions, ring size in the product is dictated by the regioselectivity of the reaction. In intermolecular reactions of terminal alkenes or alkynes, regioselectivity affects whether the major product has a linear or branched structure. The use of Lewis-basic directing groups is a common strategy for controlling regioselectivity in both intra- and intermolecular reactions. For example, an appropriately situated Lewis-basic heteroatom Y in substrate 4 controls regioselectivity by binding to the metal catalyst after migratory insertion (Eq. 3). The relative energies of the resulting metallacycles dictate the regioselectivity of the reaction. The four-membered rhodacycle in intermediate 7 is avoided in preference to the five-membered rhodacycle in intermediate 5. As a result, seven-membered product 6 is formed in preference to six-membered product 8. It has been proposed that nickel(0) catalysts operate by a different mechanism in hydroacylation reactions. Substrate 9 first combines with the nickel catalyst in an oxidative cyclization step to afford metallacycle 10 (Eq. 4). Beta-hydride elimination re-establishes the carbonyl group in alkylmetal intermediate 11, which undergoes reductive elimination to yield ketone product 12. A variety of chiral nonracemic metal catalysts have been applied in asymmetric hydroacylation reactions. For example, [Rh(BINAP)]+ catalysts are effective for the enantioselective synthesis of cyclopentanones from meso dienals (Eq. 5). The identity of the counterion and the configuration of the chiral ligand both affect the stereoselectivity of these reactions. Enantioselective intermolecular reactions have also been developed. Salicylaldehyde 14 reacts with achiral cyclopropene 15 in the presence of a chiral rhodium(I) catalyst containing Josiphos ligand 13 (Eq. 6). The reaction is diastereoselective in favor of trans isomer 16, but both 16 and 17 are formed with very high enantioselectivity. The chiral rhodium(I) complex [Rh(Tol-BINAP)]BF4 promotes the parallel kinetic resolution of racemic alkynals such as 18, which enables the synthesis of enantioenriched methylenecyclobutanones 19 and cyclopentenones 20. (Eq. 7). Hydroacylation is generally effective for the construction of cyclopentanones from 4-pentenals. However, the required starting materials can be difficult to prepare and handle. One approach that addresses this issue employs a tandem alkene isomerization, Claisen rearrangement, and hydroacylation in one pot (Eq. 8). A highly active cationic rhodium(I) catalyst promotes both the alkene isomerization and the hydroacylation. Regioselectivity is often an important concern in hydroacylation reactions. In intramolecular reactions, alkenals may give rise to isomeric cycloalkanones, for example. Lewis basic heteroatoms positioned strategically within alkenal substrates can promote the formation of a single isomer of product. For example, the nitrogen atom in the allylic amine substrate in Eq. 9 effects formation of a seven-membered product. In intermolecular reactions, terminal alkenes can form either linear or branched products upon hydroacylation. Directing groups are used to promote regioselectivity in this context as well. Directing groups may be found on one or both of the substrates. Salicylaldehydes, which contain a Lewis basic hydroxyl group linked to a fairly rigid backbone, are commonly used as the aldehyde partner in these reactions. For example, salicylaldehyde reacts with a thioether-containing alkene to afford the branched product exclusively (Eq. 10). 2-Amino-3-picoline 21 can act as a “catalytic directing group” to promote the linear-selective reaction of simple aldehydes lacking coordinating groups. Reaction of the aldehyde with 21 affords an imine intermediate that is more reactive than the aldehyde substrate (Eq. 11). Catalysts involving other metals provide complementary reactivity to rhodium(I) complexes. For example, ruthenium(II) hydride complexes catalyze the branched-selective intermolecular hydroacylation of 1,3-dienes without a need for directing groups (Eq. 12). A variety of metal complexes have demonstrated effectiveness in the hydroacylation of alkynes as well. Although ruthenium(II) complexes catalyze the hydroacylation of 2-butyne with a variety of aldehydes, more stable alcohols can be employed under these conditions because the alcohol reduces the ruthenium(II) pre-catalyst to form the active catalyst and aldehyde (Eq. 13). Hydroacylation of carbonyl compounds may afford esters, lactones, or other carboxylic acid derivatives. In an example reminiscent of Eq. 9 above, a cationic rhodium(I) complex containing a chiral nonracemic derivative of BIPHEP catalyzes the formation of seven-membered benzoxazepinones in good yield and with moderate to high enantioselectivities (Eq. 14). Intermolecular carbonyl hydroacylations can present challenges associated with Tishchenko-type dimerization and aldol reactions. Selective cross-coupling between two different aldehydes (aliphatic and aromatic) is enabled by an especially electron-rich NHC ligand in a nickel(0) complex. The aliphatic aldehyde becomes the carboxylate portion of the ester product while the aromatic aldehyde becomes the alcohol portion (Eq. 15). Intermolecular hydroacylation between aldehydes and ketones are also possible. A number of syntheses of natural products containing cyclopentane structures involve intramolecular hydroacylation as a key step. The readily available starting material limonene can be elaborated to an enal intermediate that cyclizes cleanly in the presence of a second carbonyl group. The bicyclic ketones shown in Eq. 16 have been further transformed into nepetalactones and iridomycins. Rhodium-catalyzed, intermolecular alkene hydroacylation has been applied to the syntheses of biologically active octaketides starting from aldehyde and alkene precursors containing directing groups (Eq. 17). The broad scope of the aldehyde and alkene in this reaction enables the synthesis of a variety of analogous natural products, such as dothiorelones A, B, and C.
N-Heterocyclic carbenes (NHCs) are efficient catalysts for intra- and intermolecular hydroacylation of alkenes and alkynes. The use of organocatalysis for this reaction type can be complementary to the use of a transition metal catalyst. For example, in Eq. 18 catalysis by an NHC leads to six-membered chromanone-type products; use of similar substrates in conjunction with a rhodium(I) catalyst leads to a seven-membered ring products. NHC catalysts are also effective in the hydroacylation of ketones. α-Ketoesters undergo selective hydroacylation by aryl aldehydes in the presence of an NHC, for example (Eq. 19). The use of an activated carbonyl compound such as α-ketoester or isatin suppresses homodimerization of the aldehyde partner. Cross-Tishchenko reactions of distinct carbonyl compounds can be accomplished selectively if the starting materials exhibit strong electronic differences. For example, a thiolate generated in situ from a thiophenol derivative and phenyl Grignard reagent catalyzes the cross-Tishchenko reaction of trifluoromethyl aryl ketones with aryl aldehydes (Eq. 20). Metal-catalyzed hydroacylation reactions should be performed using anhydrous and rigorously degassed solvents and reagents in an atmosphere of nitrogen or argon. Typically, the active catalyst is generated before addition of the substrates to the reaction mixture. Rhodium catalyst precursors with chelating alkene ligands, such as [Rh(cod)2]BF4, are commonly subjected to hydrogenation in the presence of the desired ligand to form catalytically active complexes. Alternatively, fluorobenzene may be used as a weakly coordinating ligand that can be displaced by the desired ligand immediately prior to hydroacylation. Rhodium(I) fluorobenzene complexes generated in this fashion are stable in air. To a 1-dram vial was added (R,R)-Me-DuPhos (3.1 mg, 0.01 mmol, 5 mol %), [Rh(nbd)2]BF4 (3.7 mg, 0.01 mmol, 5 mol %) and degassed CH2Cl2 (1 mL) inside a nitrogen-filled glove box. This solution was transferred to a Schlenk tube equipped with a stir bar, and the tube was sealed. The Schlenk tube was removed from the glove box, the mixture was stirred for 5 min, and subjected to one freeze-pump-thaw cycle. The catalyst mixture was hydrogenated for 30 min at rt with stirring and then degassed by three freeze-pump-thaw cycles. The sealed Schlenk tube was brought back into the glove box. A solution of 2-(but-3-en-1-yloxy)benzaldehyde (35.2 mg, 0.2 mmol) in degassed CH2Cl2 (1 mL) was then added to the Schlenk tube, and the mixture was stirred at rt for 24 h. The mixture was concentrated in vacuo and the residue was purified by preparative thin-layer chromatography (hexanes/EtOAc, 9:1) to afford the product (30.8 mg, 88%) as a colorless oil: GC-FID analysis, tR1 9.77 min, tR2 9.92 min, 99.0:1.0 er (Cyclodex-β, H2 mobile phase, 3.2 mL/min, 150–160° at 0.7°/min); [α]25D – 126 (c 0.77, CHCl3) [the absolute configuration of the product was not determined]; IR (neat) 2932, 1683, 1601, 1478, 1449, 1274, 1203, 1051, 758 cm–1; 1H NMR (400 MHz, CDCl3) δ 7.74 (dd, J = 7.7, 1.7 Hz, 1H), 7.39 (ddd, J = 8.0, 7.3, 1.8 Hz, 1H), 7.09–7.03 (m, 2H), 4.53 (ddd, J = 12.4, 7.0, 2.3 Hz, 1H), 3.90 (td, J = 12.3, 5.0 Hz, 1H), 3.19 (ddq, J = 10.6, 7.6, 6.7 Hz, 1H), 2.53 (ddt, J = 13.5, 12.2, 7.2 Hz, 1H), 1.73 (dddd, J = 13.2, 10.7, 5.0, 2.4 Hz, 1H), 1.23 (d, J = 6.6 Hz, 3H); 13C NMR (100 MHz, CDCl3) δ 203.7, 162.4, 133.1, 129.6, 128.6, 122.2, 120.1, 72.5, 44.1, 36.5, 15.3; HRMS (EI) m/z: calcd for C11H12O2, 176.0837; found, 176.0841. ↑ Tsuji, J.; Ohno, K. Tetrahedron Lett. 1965, 6, 3969. ↑ Fairlie, D. P.; Bosnich, B. Organometallics 1988, 7, 936. ↑ Jun, C.-H.; Lee, H.; Hong, J.-B. J. Org. Chem. 1997, 62, 1200. ↑ Fairlie, D. P.; Bosnich, B. Organometallics 1988, 7, 946. ↑ a b Coulter, M. M.; Dornan, P. K.; Dong, V. M. J. Am. Chem. Soc. 2009, 131, 6932. ↑ Hoshimoto, Y.; Hayashi, Y.; Suzuki, H.; Ohashi, M.; Ogoshi, S. Angew. Chem., Int. Ed. 2012, 51, 10812. ↑ Wu, X.-M.; Funakoshi, K.; Sakai, K. Tetrahedron Lett. 1992, 33, 6331. ↑ Phan, D. H. T.; Kou, K. G. M.; Dong, V. M. J. Am. Chem. Soc. 2010, 132, 16354. ↑ Tanaka, K.; Fu, G. C. J. Am. Chem. Soc. 2003, 125, 8078. ↑ Okamoto, R.; Tanaka, K. Org. Lett. 2013, 15, 2112. ↑ Arnold, J. S.; Mwenda, E. T.; Nguyen, H. M. Angew. Chem., Int. Ed. 2014, 53, 3688. ↑ Coulter, M. M.; Kou, K. G. M.; Galligan, B.; Dong, V. M. J. Am. Chem. Soc. 2010, 132, 16330. ↑ Park, Y. J.; Park, J.-W.; Jun, C.-H. Acc. Chem. Res. 2008, 41, 222. ↑ Shibahara, F.; Bower, J. F.; Krische, M. J. J. Am. Chem. Soc. 2008, 130, 14120. ↑ Williams, V. M.; Leung, J. C.; Patman, R. L.; Krische, M. J. Tetrahedron 2009, 65, 5024. ↑ Khan, H. A.; Kou, K. G. M.; Dong, V. M. Chem. Sci. 2011, 2, 407. ↑ Hoshimoto, Y.; Ohashi, M.; Ogoshi, S. J. Am. Chem. Soc. 2011, 133, 4668. ↑ Suemune, H.; Oda, K.; Saeki, S.; Sakai, K. Chem. Pharm. Bull. 1988, 36, 172. ↑ Takahashi, Y.; Tanaka, M.; Wu, X.-M.; Sakai, K. Nat. Prod. Lett. 1992, 1, 217. ↑ von Delius, M.; Le, C. M.; Dong, V. M. J. Am. Chem. Soc. 2012, 134, 15022. ↑ Hirano, K.; Biju, A. T.; Piel, I.; Glorius, F. J. Am. Chem. Soc. 2009, 131, 14190. ↑ Chan, A.; Scheidt, K. A. J. Am. Chem. Soc. 2006, 128, 4558. ↑ Cronin, L.; Manoni, F.; O' Connor, C. J.; Connon, S. J. Angew. Chem., Int. Ed. 2010, 49, 3045. ↑ Chaplin, A. B.; Hooper, J. F.; Weller, A. S.; Willis, M. C. J. Am. Chem. Soc. 2012, 134, 4885. This page was last modified on 28 February 2019, at 20:55.